概要： This discussion with Momoyo Homma about the work of artists/poets/philosophers/architects Arakawa and Madeline Gins took place in the Reversible Destiny Lofts Mitaka where the Tokyo part of the Arakawa/Gins office is situated. We begin by introducing their work through a biographic approach, then through our interpretations of the manifesto “We Have Decided Not to Die,” which fuels the creative process of the five architectural projects built in Japan and in the United States, as well as the multitude of non-built ones. We conclude the conversation by describing the space around us, one of the Reversible Destiny Lofts: its bumpy floor, its sphere room, its colors, and all the others architectural apparatuses that challenges and strengthen any body whether young or old. 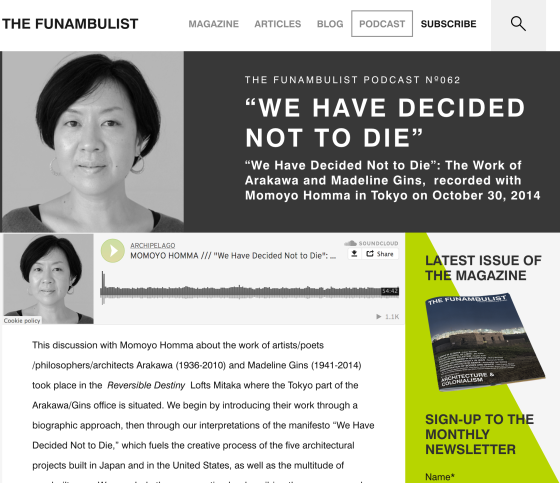 This conversation comes as a useful complement to the many contributions made by and for The Funambulist about Arakawa and Gins’s work (see below). Momoyo Homma is the Director of the Arakawa + Gins Tokyo office. She studied and graduated from Musashino Art University before moving to Costa Rica in 1993 where she worked as a full-time professor at Casa del Artista (San Jose, Costa Rica). She then worked as an assistant program director, project “Al MARGEN” by ILPES (at that time), San Jose, Costa Rica. After coming back to Japan in 1998, she worked at Caribbean Friendship Association, Promo-Arte Latin American gallery (both Tokyo, Japan). In 2000, she firstly met ARAKAWA, and established ABRF, Inc. in 2002, where she is currently serving as the present post.